Two names stand out from the long list of winners at the Sawiris Cultural Awards; director-turned-author Nadia Kamel and professor of American literature at Cairo University Sahar El-Mougy. 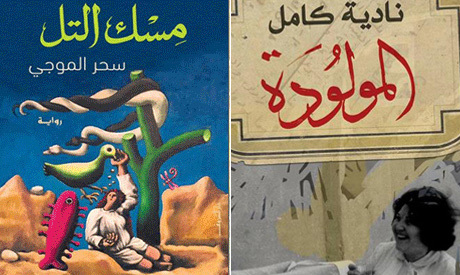 Nadia Kamel and Sahar El-Mougy both won the award for best novel by an established writer, winning an EGP 150,000 award split between the two. Kamel won for her outstanding book Al-Maowloda (The Newborn), published by El-Karma, and El-Mougy won for her novel Mesk El-Tal (The Musk of the Hill), published by Dar El-Shorouk. The awards were announced on 25 January during a ceremony at the Cairo Opera House's main hall. Kamel's book is based on the life of her mother, and takes place in the first half of the 20th century "in an Egypt that doesn't exist anymore," before the exodus of the Jewish community from the country. Her mother and the protagonist of the novel, Naela, was originally born Mary Ely Rosenthal to a Jewish Egyptian father and an Italian Christian mother. Her parents met in the 1920s in Cairo, where she was born. The book tracks Mary's life and struggles and the hard choices she had to make. Nadia was and still is a director, producing and directing the documentary Salata Balady (Local Salad). She has also worked as an assistant to many renowned directors, including Attiyat Abnoudi, Youssef Chahine and Yousry Nasrallah. The writer of Mesk El-Tal, Sahar El-Mougy is best known for her novels Daryah (1991) and Noon (2008). Her novel Musk of the Hill is about three iconic characters; Amina, the fictional submissive mother from a trilogy by Naguib Mahfouz, Catherine Earnshaw, the protagonist of Emile Brontë’s Wuthering Heights, and Mariam, a clinically depressed psychiatrist. El-Mougy expressed her happiness for winning the prize, adding that she is proud to be sharing it "with a beautiful woman artist such as Nadia Kamel." "A hundred years ago, women struggled to open doors for other women to create art. I believe we are the heirs of this legacy. When I write, I do not do it for a reward, but just to maybe see/know that a reader may think and question his or her life because of the book," she said. "When a prize does come, I feel like I’ve received a pat on the back and I know the book will reach more readers who may be thinking or questioning their lives and choices. It thrills me to nudge people a little into realising that they do have choices."